You know all those people who say that mashed cauliflower tastes exactly like mashed potatoes? I am here to tell you that those people have probably not had a mashed potato in awhile. Much like Sara isn’t going to to pretend that spaghetti squash is just like sitting down to a big ol’ bowl of homemade pasta in your favorite Italian restaurant, I’m not going to pretend like cauliflower rice is just like regular white rice. That said. I really like cauliflower rice. I’m not anti-carbs or anti-grains or anything, but for me personally, if I’m going to blow 120 calories on carbs, I’d rather blow it on a cookie than on a bowl of rice (and that’s just a 1/2 cup of rice, which is just a tease. At least for a girl who likes to eat.) It’s an easy way to get some extra veggies into my diet, it’s quick, and it transforms one of nature’s more offensive vegetables (sorry…I’m not generally a fan. I’m sure there are people out there who love a big bowl of raw cauliflower, but I’ve never met them) into something mild and easy to make. 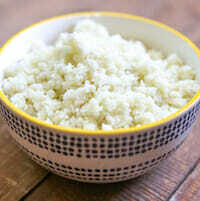 Now, you can’t just use finely chopped cauliflower interchangeably with regular rice. 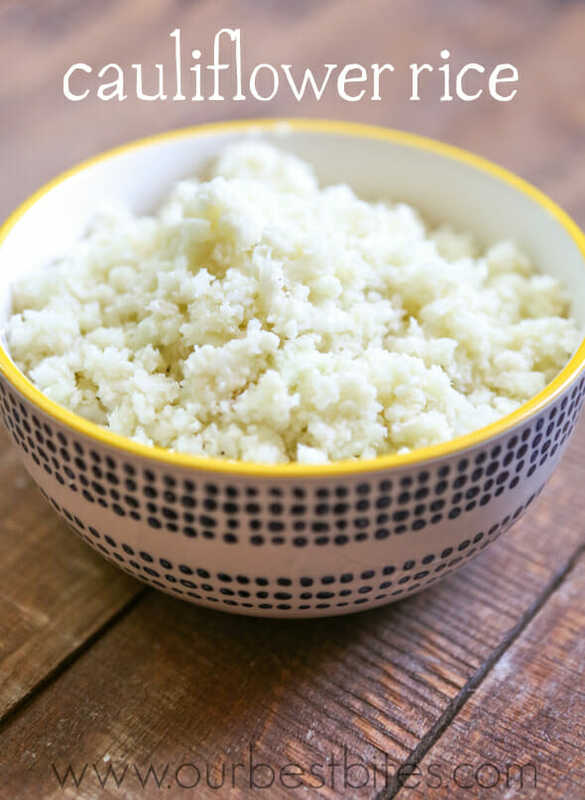 Here’s a handy guide to help you know when you should and shouldn’t use cauliflower rice. If you’re cutting back on carbs. If you’re trying to find new and exciting ways to implement cruciferous vegetables into your diet. If you want to mix regular rice with something else to make it a little less calorie-dense. If you don’t like/are allergic to/are scared of rice. In soups, casseroles, and other dishes where regular rice absorbs liquid and helps thicken the final dish. In rice pudding. Do people still eat rice pudding? Anything where you’re expecting the rice to kind of soak up juices/sauces/liquids of something else. I mean, you can still use cauliflower rice and it will taste good, just don’t expect it to operate quite the same way with your beef and broccoli. To make this super-easy side dish, you’ll need a head of cauliflower. You’ll also need a little olive oil (I use our garlic olive oil), a clove or two of garlic, and salt and pepper to taste. 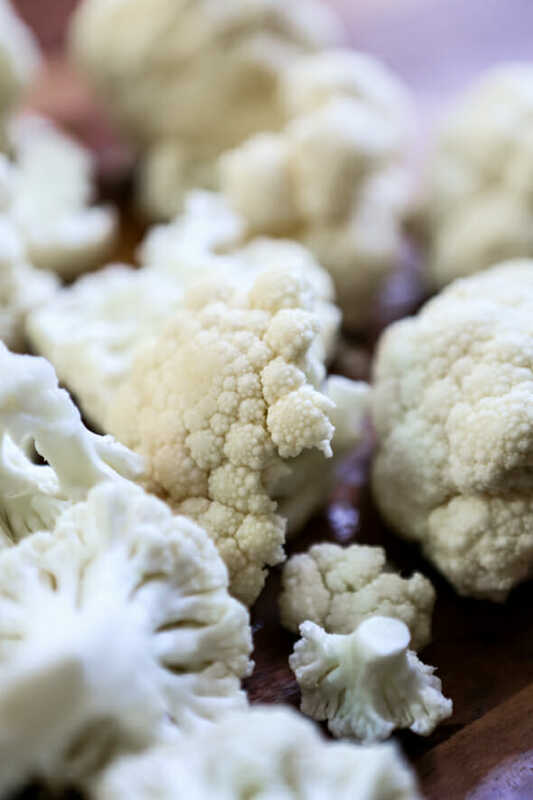 Using a sharp knife, cut the stem off of the cauliflower, then break the cauliflower into small-ish florets (it will happen pretty naturally–they don’t need to be bite-sized or anything, just wherever they break naturally). 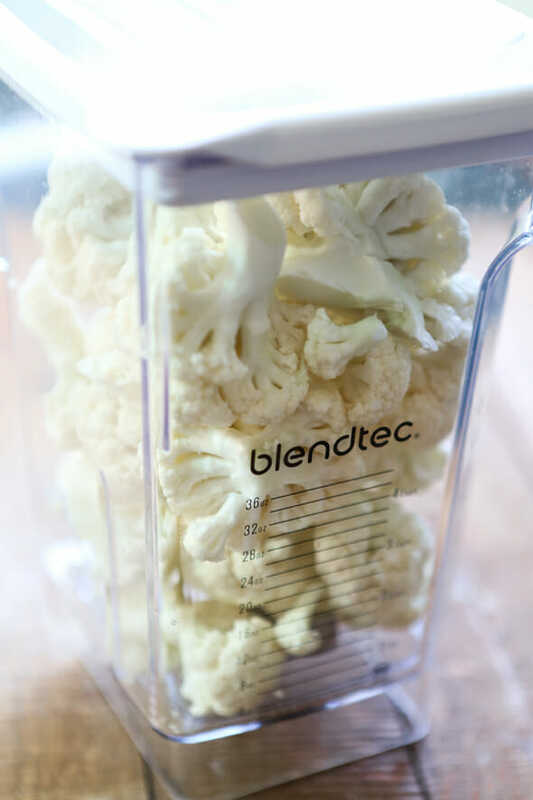 Place the cauliflower pieces into a food processor fitted with a chopping blade or a heavy-duty blender (my Blendtec does the job). You’ll probably need to do it in batches. Which is exactly what I didn’t do in this picture–only fill it up about halfway. Do as I say, not as I do. Using the pulse setting, chop the cauliflower until it reaches a rice-like consistency. If you don’t have a blender or a food processor, you can use a cheese grater, it just requires a little more elbow grease. 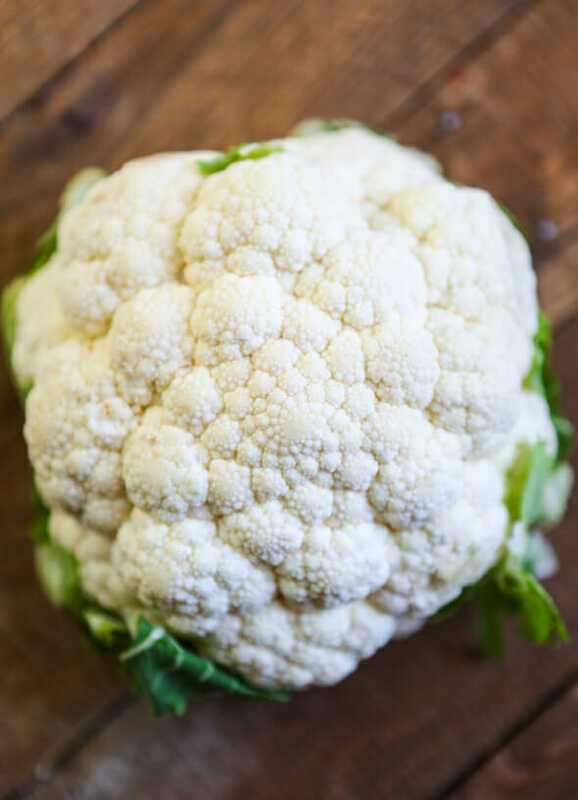 Using a sharp knife, cut the stem off of the cauliflower, then break the cauliflower into small-ish florets (it will happen pretty naturally–they don’t need to be bite-sized or anything, just wherever they break naturally). Place the cauliflower pieces into a food processor fitted with a chopping blade or a heavy-duty blender (my Blendtec does the job). You’ll probably need to do it in batches. Using the pulse setting, chop the cauliflower until it reaches a rice-like consistency. Kate, you must be psychic. I bought cauliflower last night to try out a few things, including cauliflower rice, but I needed to look up a recipe & ran out of time. Our kids are rice fanatics, so I’d like to try mixing this in a little. I’ll definitely be trying yours today! Last night I did get a chance to try out this Creamy Cauliflower Sauce, which was *amazing*. I didn’t have high hopes, but the reviews were so good, and it ended up tasting like it was loaded with cream & cheese when there was none. (Just a little skim milk & butter) Husband & kid approved. There were lots of great ideas for subbing this in lasagnas & any dishes with creamy sauce, so I’ll need to experiment with that too. You girls have got to try it! I”m totally with you! If I’m going to blow 120 calories, I’d rather consume a candy bar! I know. It’s terrible than white rice, which, while good, I can do a substitution with this cauliflower rice and save me a trip to the gym! Hi! My name is Heather, and I love to consume a big bowl of raw cauliflower! There, you’ve met one 🙂 Then, put a big bowl of steamed cauliflower in front of me and I’m in heaven. I am excited to try your cauliflower rice! Unfortunately I have neither a food processor nor a high-powered blender, but I’ll figure it out. Thanks for the recipe! We made cauliflower rice last week using a grater instead of a food processor and now my husband officially eats cauliflower! I thought the texture was not so much like rice, but rather couscous. Again, no absorption like couscous, but more the texture and feel. Hurray since I’m newly gluten free! I love cauliflower rice. I have sautéed it with coconut oil and it was super yummy that way. Funny that you posted this today. I made a stir fry on Saturday night and the whole time we were eating I was thinking that I should try mixing in some cauliflower rice. I’m glad you posted instructions because I would have guessed all wrong. And we eat rice pudding, but only on Christmas Eve. I would like to try this with my kids. They may actually like cauliflower if they try it like this. I love your realism. Healthy substitute are great but people who think you can’t tell when you leave out the butter and oil in brownies are lying to us and themselves. Excited to try this! Kate, I’m sorry, I have no comment on the cauliflower rice. I probably will never make it. But I just had to comment on rice pudding – I just made rice pudding for the first time two weeks ago! And my family was like, why are you making that?? It was one of those things on my once-in-my-life-I-must-make-it list. I used leftover eggnog in it and it was delicious! I would love to hear from fellow readers or anyone that has used this in place of rice. What kind of recipes would it work as a substitution? Because my family would be just as excited to eat that plain as they would a big old bowl of rice, which is not at all. Thanks!! I use cauliflower rice all the time to make burrito bowls for my family. I take the rice and sauté it as described above. Then I add a few spices like chili powder or cumin–just a sprinkle (you can also just use packaged taco seasoning). Then we eat it with shredded taco chicken on top with lettuce, black beans, sour cream, cheese, guacamole, salsa, etc. You can eat this with a fork or scoop with tortilla chips. It’s one of our favorite meals to eat! Rice Pudding! OH yes, people still eat that. We love it!! Must comment here – rice pudding is awesome! My husband is of Greek/Italian heritage, and rice pudding and Greeks go together like pasta and Italians. I had never thought much of rice pudding until I tried my mother-in-law’s recipe. It is so delicious and comforting – rich, thick, sweet, with just enough texture to keep it interesting. It’s probably my husband’s favorite dessert, though I only make it once in a while because it is a bit calorie and cholesterol dense. Don’t knock it ’til you’ve tried it! Thanks for sharing. I’ve never tried cauliflower rice. I have a favorite cauliflower recipe. Although it’s not as low-cal as your cauliflower rice, it’s delicious. I’m sad to know that rice pudding is outdated. I’ll be sure to tell my slow-cooker sticky rice pudding with mangos that. I would love that recipe! I make rice pudding very regularly. My husband loves to take it to work because it is high protein and sticks long enough to keep him satisfied. I use brown rice too. Made this for the first time last night….I loved it! The kids loved it! The husband loved it and the Sister loved it! Thanks for talking me into it. I had my doubts. Yay! I was just thinking about making my favorite chicken korma, I will try this with it to cut some of the calories. I envisioned cooked cauliflower being put through a potato ricer. But I guess that would create light and fluffy mashed cauliflower, not rice. I use it as biting with sliced carrot, celery sticks when I have people over for drinks. use blue cheese, garlic and salsa dressings to dip these veggies in. Great on a hot day with ice cold beer. Thanks for the recipe. 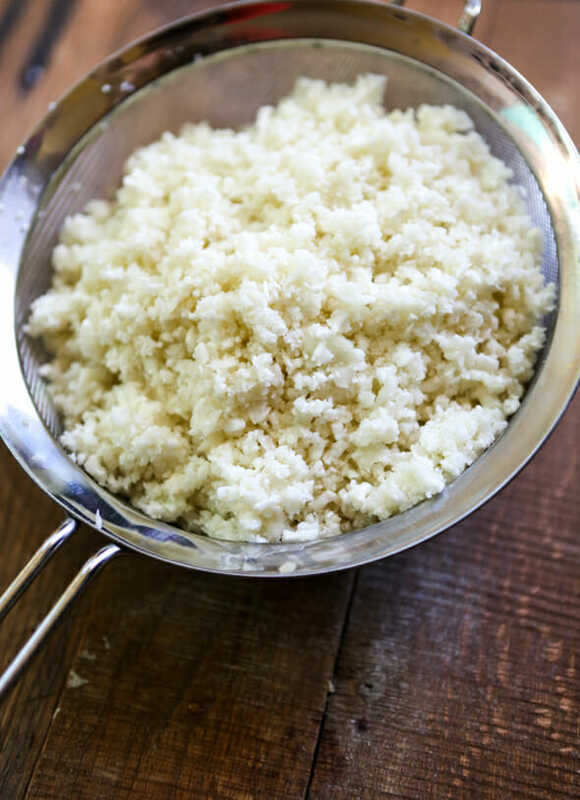 The one thing I’m still unsure of with cauliflower rice is when/ how to rinse it. It needs to be totally dry to make the rice, right?